Technology created by two Year 13 pupils at King Edward’s School, Birmingham has resulted in top awards at a prestigious national design competition. Shonak Joshi was crowned the winner of the Triumph Design Awards 2018 and George Laight secured third place in the national final of the competition, which was held at the motorcycle manufacturer’s headquarters in Hinckley on Saturday 7 July. Shonak particularly impressed the judges with his winning project, The Smart Protect, a single smart device designed to protect the vulnerable and elderly. The device works by alerting relatives, via their smartphones, when it detects harmful gases, smoke, or motion caused by potential break-ins, and also acts as a home voice assistant. George also impressed them with his project, SWOOP mini, an affordable, collapsible and portable cable camera that provides an alternative solution to the very expensive cable cam systems currently on the market. 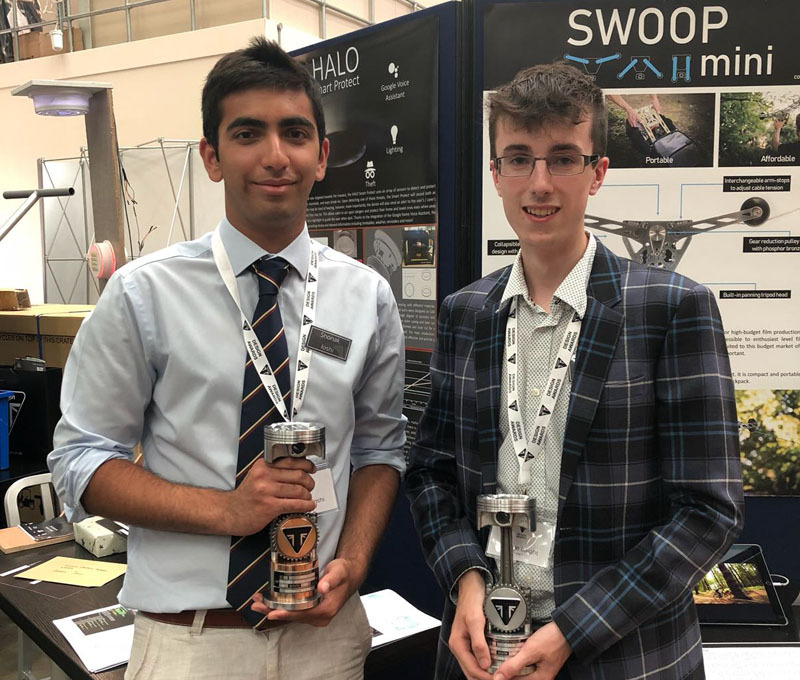 In addition to taking home the winner’s trophy and £500, Shonak will receive two weeks of paid work experience in Triumph’s design department and be considered for university sponsorship, while George will receive a week’s work experience and £100. The awards came the day after both pupils received their International Baccalaureate Diploma results, each achieving 43 points out of a maximum of 45 and securing their places at top universities. Shonak will read engineering at Queens’ College, Cambridge and George will study industrial design and technology at Loughborough University. Then, on Monday 9 July, the boys were recognised again for their design talents, each winning prizes at the final of the Rotary Club Design and Technology Awards, hosted at Edgbaston Golf Club. Shonak won the ‘Ideas’ category with The Smart Protect and George won the ‘Innovation’ category for his laser activated camera system for photographing mountain bikers. Both were presented with £100, an encyclopaedia and a certificate. Phil Balkham, Head of Design and Technology at King Edward’s School, said: “I am absolutely delighted for both Shonak and George on all of their recent achievements. The Triumph Design Awards are open to 16- to 18-year-olds who have used design to solve a real world problem, and aim to encourage and celebrate creative thinking, innovative problem solving and the ability to produce feasible solutions to real world challenges.